Hearts turn toward gratitude this time of year as we take time to serve others. It is through giving of ourselves that we learn the value of life. Nothing compares to watching a heart warm or smiles appear as someone in need is served. I recently had an experience that will forever cement in my heart an understanding of the lessons taught in the story of the Widow’s Mite. There was a need of a mother who was caring for her daughter who has contracted Rett syndrome. The daughter is twelve, the mother a single parent working full time as a teacher. This young lady has two sisters who live at home with she and her mother; one older and the other younger. As this child ages, her physical abilities have deteriorated as her weight naturally increases with growth. Each day, week, month has proven more difficult for her mother to care for her. Carrying the child has slowly created ever worsening back problems. What was once a fairly easy lift from the car to the living room or from the main floor to the upstairs bedrooms has become increasingly more difficult! Friends learned of her plight and set up an account taking donations to place an electric chair lift in the stairwell at home. Enough money was raised. After installation, this young lady can be placed in the chair and lifted to the upstairs where she sleeps. Mobility then allows freedom to move anywhere in the home and with little to no assistance. Outside however, there is a 48” differential from the driveway (ground) to the main floor. This meant that while the lift helped with inside mobility, there remained a need for getting from the car to the home. 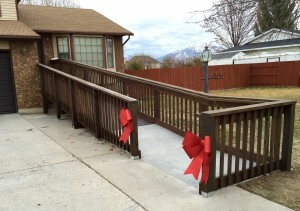 A friend contacted Leslie Shell, a member of the Salt lake Home Builder’s Association who went about finding a solution. Steve Dailey, a member and principal of Steven Dailey Construction volunteered to build a handicapped ramp for this family (ProBuild donated materials and others helped). The most beautiful ramp you have ever seen was built to ensure there weren’t any remaining barriers. That’s not the story! The story in the story is getting to know this amazing little family and the positive attitude they portray. The youngest child is a riot. She is outgoing, funny, full of energy and love. The older sister is where I want to take this story. We were outside working (about 8 of us) as the weather began to turn. Clouds were appearing and the wind began to blow. We were staining the wood on the ramp as she got home from school. Nearby, and on the ground we had coffee, hot chocolate, and donuts which she didn’t see. We could tell she was very excited about how the ramp was turning out and wanted in some way to help. Her smile was from ear to ear as she suggested how beautiful it looked and how excited her sister would be. Into their home she disappeared as we kept working. After about an hour she came out of the front door with a tray of drinks. As first we couldn’t really tell what she was doing, but as she approached the first helper you could see something remarkable was happening. Each person took a cup whether they wanted one or not. Why? We could see the gift was from her heart; something more than a warm beverage, it was an expression of love and gratitude. This family barely gets by; often going without many of the things we take for granted. You see, by lemonade stand criteria, this offering may have never sold. It was a hot beverage in a solo cup designed for cold drinks, each cup had a soda straw in it, the temperature was barely warm, at best it was watery, and the cups were not quite half full. No one cared! As the drinks were consumed they excited every taste bud, filled the soul, and warmed the heart. To a person we felt this was the “world’s best” hot chocolate. You see, it isn’t the quality of the gift that matters! It is the meaning behind the gift. Each of us imagined she must have contemplated for that full hour on ways to help. She racked her brain on differing means of service. I believe the hot chocolate was made from packets. I would imagine these were being saved for a family holiday tradition. Her gift could have been an accumulation of all that existed in their pantry. We may never know. Fact is, she gave us her all, and in doing so; made our small token of service more meaningful than words can express! This entry was posted in Business and tagged gift of the heart, service, widows mite. giving your all. Bookmark the permalink. This was a beautiful post and she was so sweet. It was the worlds best hot chocolate and her generosity was perfect. Thanks to everyone for helping and most of all for letting me tag along to help. This was one of the greatest things I have ever done.